Last week I was doing some birthday feasting. 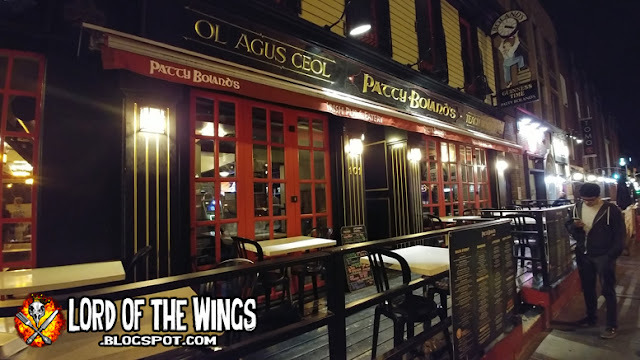 It was Monday night, which is the wing night in the city. It's also the hardest night of the week for me to get out for wing night. 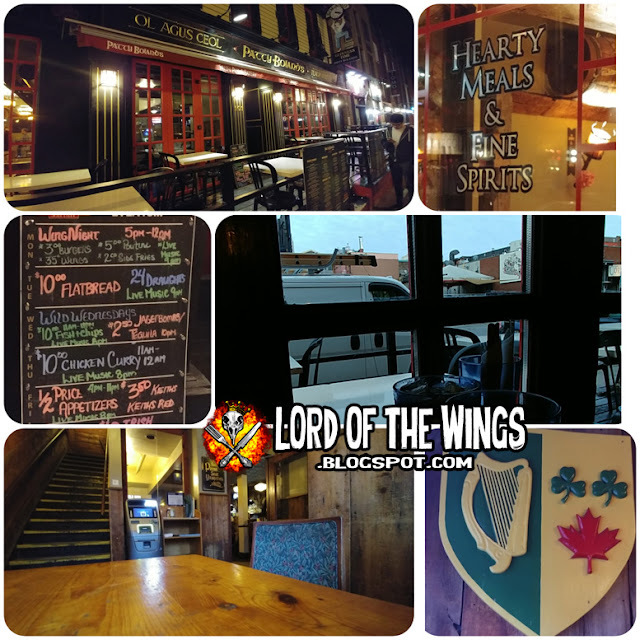 But it was my birthday so LJ taking me out, so the only question was, what wing night was I going to take advantage of? Well, I really wanted to go back to Patty Bolands. 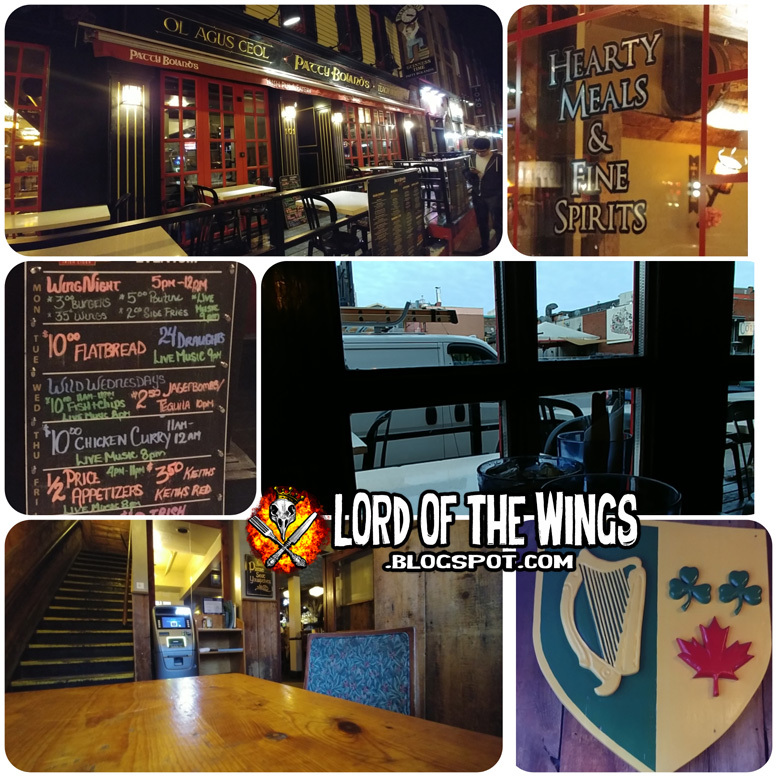 I was shocked that I had not done a full review of Patty Boland's in the Byward Market. I've been there a few times, but never wrote about my experience. 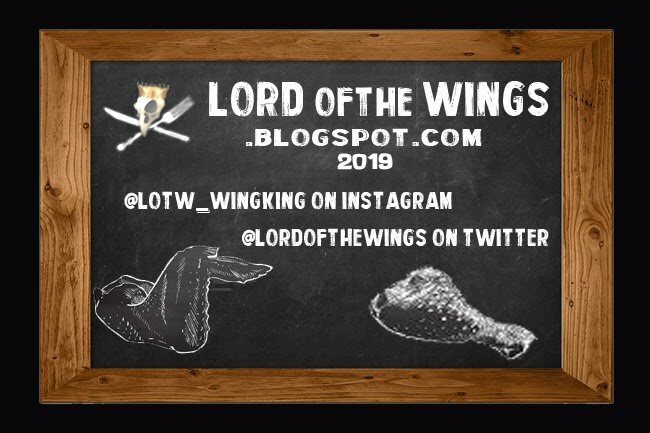 The closest it seems was advertising their 1 Cent Wing Night in September 2017, and then I just posted my Instagram post from January of 2017 when I actually did go. Weird. So we arrive on Monday night. The sign says seat yourself, so we grab a lone table in the front window where there will be good light, some privacy, and a view of the street. The atmosphere inside is Irish Pub and the place is clad in wood. It's dark, it's got character; I like it. Our server Carley was friendly and took good care of us. We kind of laughed because she brought us the specials menu, but not the whole menu. Maybe they only serve their specials on Monday? 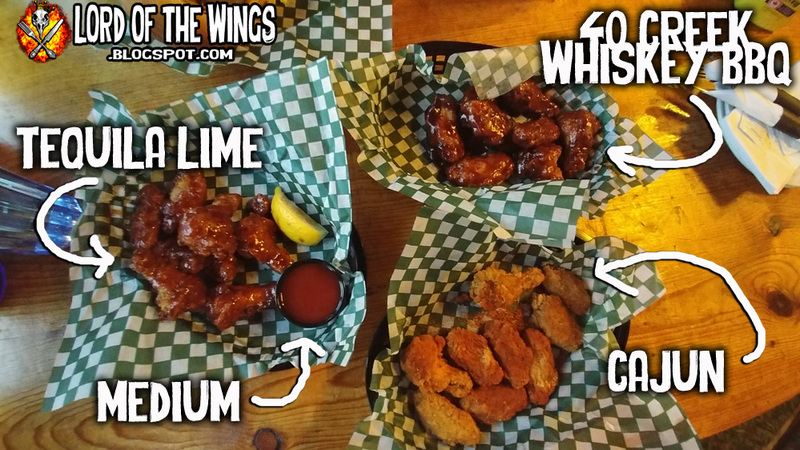 As you can see, Monday night is all about the wings. 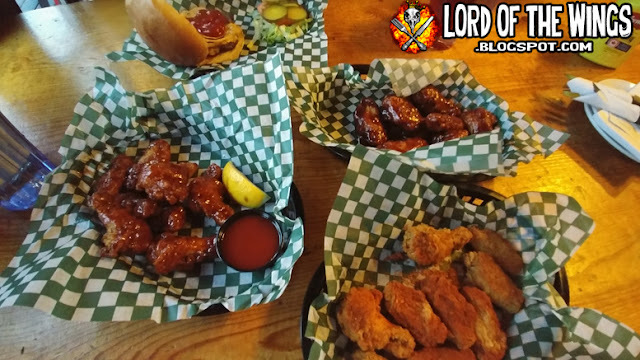 Yes they have fries and poutine and burgers, but wings are where its at. Oh and fried cauliflower 'wings'. There are a lot of sauces to choose from, but their wing night advertisements are a little sketchy. See they say its $0.35 wing night, but only 3 of the basic flavours are at that price; the rest are $0.55. 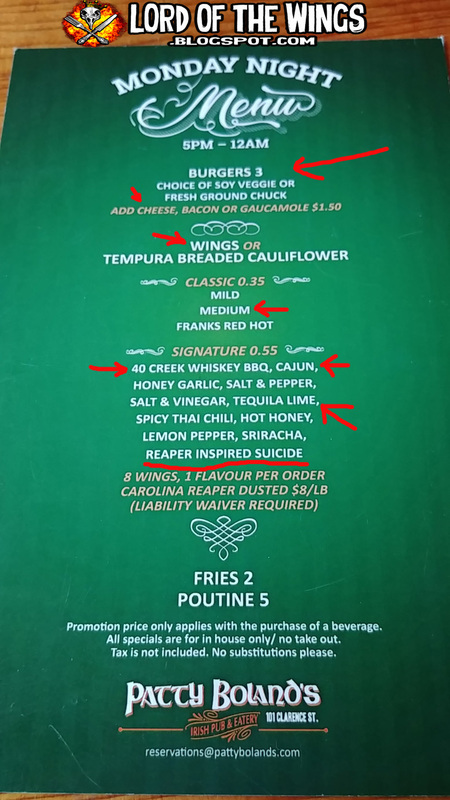 But they aren't really $0.55 either - you have to order them in batches of 8, making the Classic wings $2.80 and the Signature wings are $4.40. Those are still good deals by a long shot. Why they gotta fudge the truth? Also, my Diet Coke was $5. It was free refills, but $5 is pretty steep for pop. Not sure if this is every night or just wing night. But FYI. 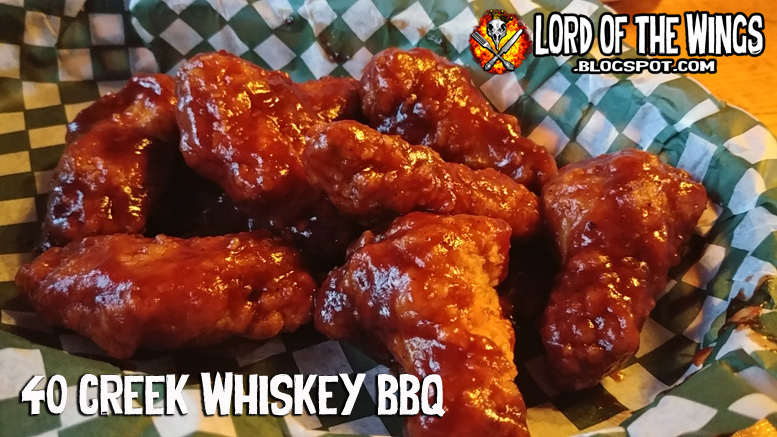 So while we were getting a bunch of wings to try, LJ wanted something more to actually make up the meal. She went with the $3 hamburger and added cheese for $1.50. The toppings came on the side, a neat little pile of shredded lettuce, tomato, and pickle and ketchup and mustard on the table. 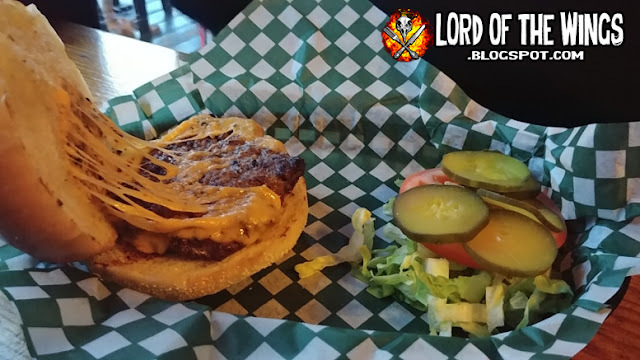 While I liked the stretchy cheese game going on, I thought that this was going to be a burger that tasted like you get what you pay for (cheap). But LJ tried a bite and said it was good. I tried a bite and I was impressed. It had a great beefy flavour. It was simple but just tasted good. LJ was craving it (and the price) a few days later! 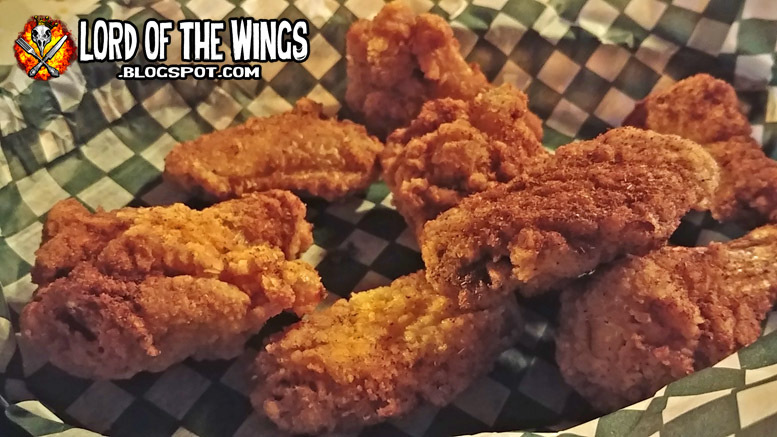 So the burger was a hit, but how would the wings fare? I can't speak for wings on a regular night. They might come with veggies and dip? 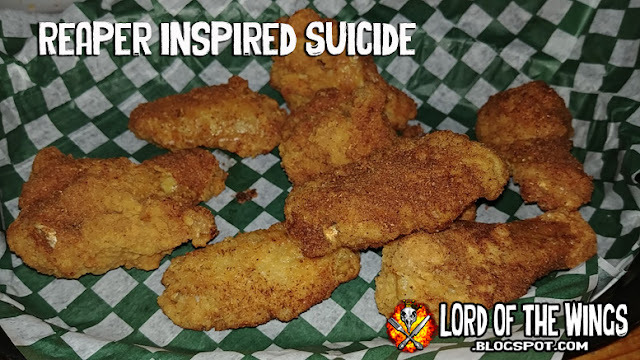 They do come with fries though; wing night wings do not. I don't know how many wing you get for sure on a regular night, but on wing night you get 8 in an order. We also got a side plate (for bones) and napkins. These wings were not very big, length wise. They were pretty uniform in size, but they were in the small/medium zone. 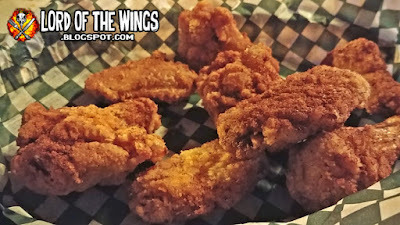 But while they weren't long, they were a very meaty wing. 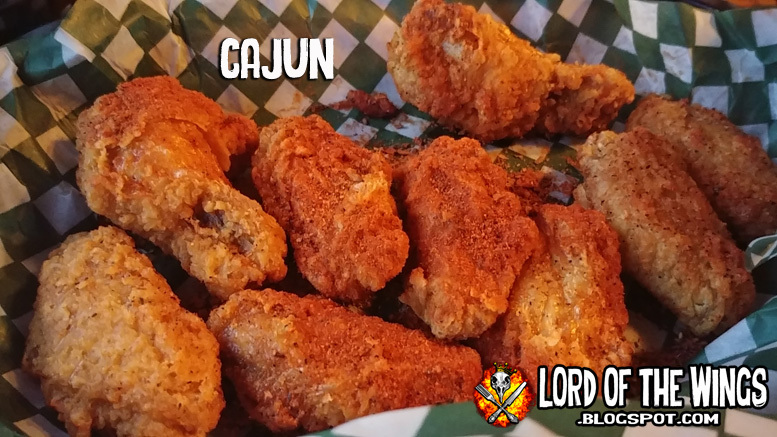 They were also dusted and fried crispy - almost perfect. The meat was tender inside too. If the chicken was just a bit bigger these would be top notch. With it being wing night, we took advantage of trying a bunch of sauces and flavours. 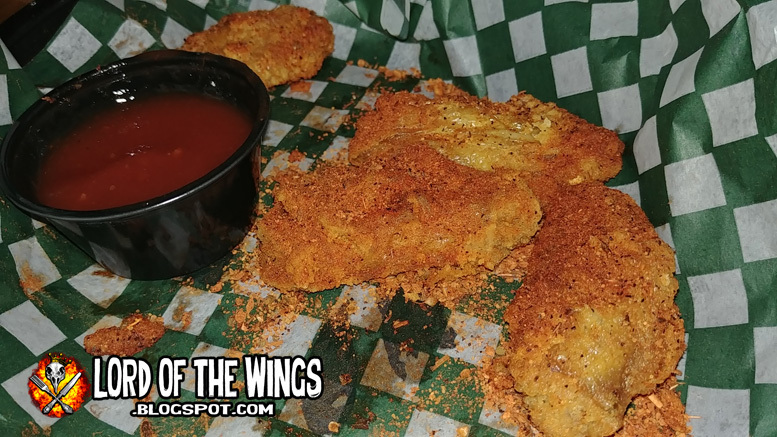 When the wings came, the sauced wings were very saucy, and the dry rubbed wings had lots of seasoning. I like that. I like that a lot. 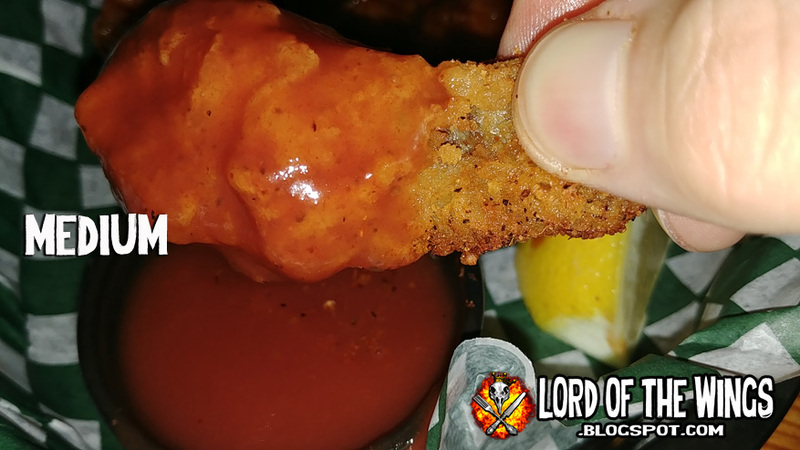 The BBQ sauce was sweet and savory. It was a bit sticky, but it wasn't uber sweet. Just a nice balance. I would totally get these again. These dry seasoned wings came out crispy and hot. The seasoning mix was pretty standard Cajun spice rub - garlicky, salty, spicy. 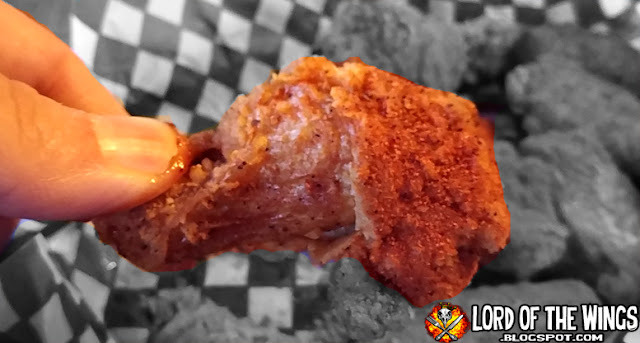 It worked well with the fried wing. We got a side of medium so the dry Cajun wings could be dipped if needed. This was $1 extra. 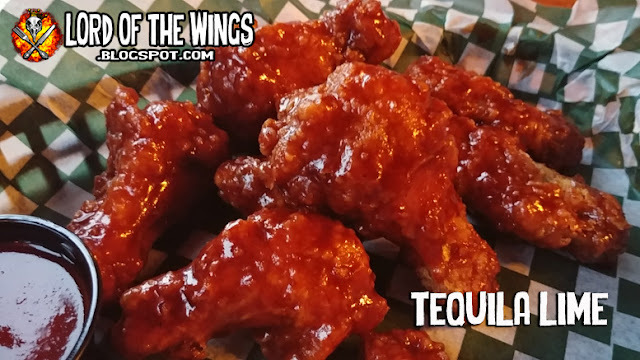 It's a good sauce, partially sweet, partially spicy. A true medium. These were the hit of the night. These wings were saucy, sticky, sweet and spicy (the four s's). It's like a BBQ sauce, with a little hint of zingy lime. Sweet and sour is what I'm saying here. So very good. Now we had a good feast, but I didn't want to end there. It was my birthday, so I wanted a challenge. And I took it and got their Carolina Reaper Wings. If you are not aware, the Carolina Reaper is the world's hottest chili pepper. One pepper is over 2 million Scoville units. I didn't buy it, and I felt pretty confident about doing this. LJ did not. She was not happy because she remembers vividly what happened when I did a ghost pepper challenge the last time, and I suffered. I suffered a lot. But I didn't think it would be that bad. They pulled out a waiver. 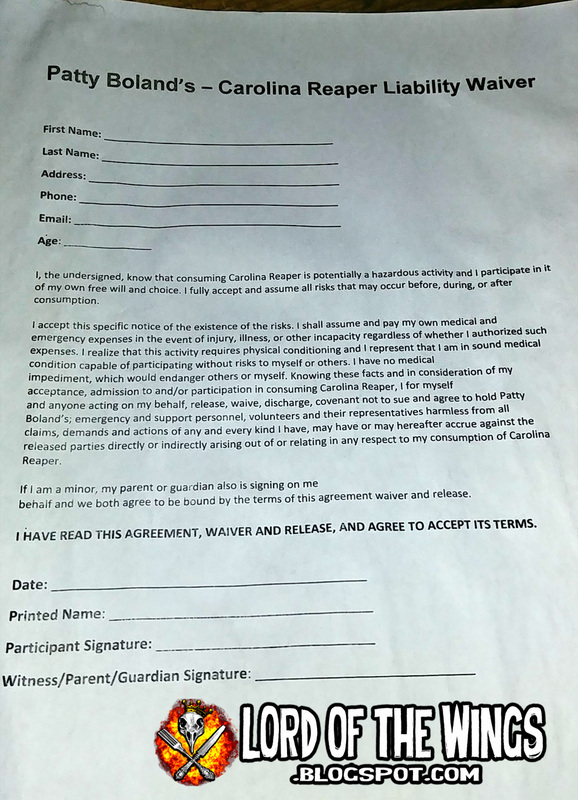 It looked pretty official - I've filled out quite a few waivers and many are goofy or intended for fun. This one seemed serious. I still wasn't worried. Carley didn't even try to talk me out of it. That made me feel even more confident about ordering them. I asked later on if many people ordered them and she said at least once every Monday night. Most people fail. Hmmm. In no time they came out and I had 8 glorious deep fried wings in front of me. 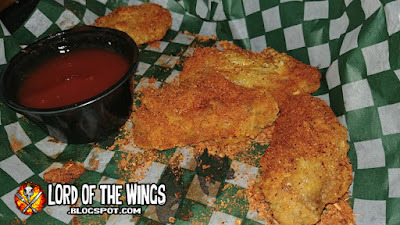 LJ and I were both surprised that these were a dry rubbed wing and not a sauce concoction. They were unevenly coated, but I didn't notice that until looking at the photos later. I just saw 8 freshly fried wings that smelled like heat. I was ready for a little pain and dove into these wings. I ate one wing. ONE. That is all I could take. I ripped open the wingette and pulled out a bone. I bit into it and it immediately attached my throat, my lips, my tongue. It was a dry, sharp, peppery, white heat. My stomach stopped me and went "WTF?" My nose started to run. My eyes were almost starting to water. My stomach caused a few warning hiccups (this happens since that 2011 incident when I get anywhere NEAR really spicy food). I must be getting old, because 1) I can't take the heat and 2) I am a little less reckless. Yes, I could have powered through the extreme pain, but I was going to be in serious pain later. And in the moment. I didn't want to go through that. I didn't want to be sick. 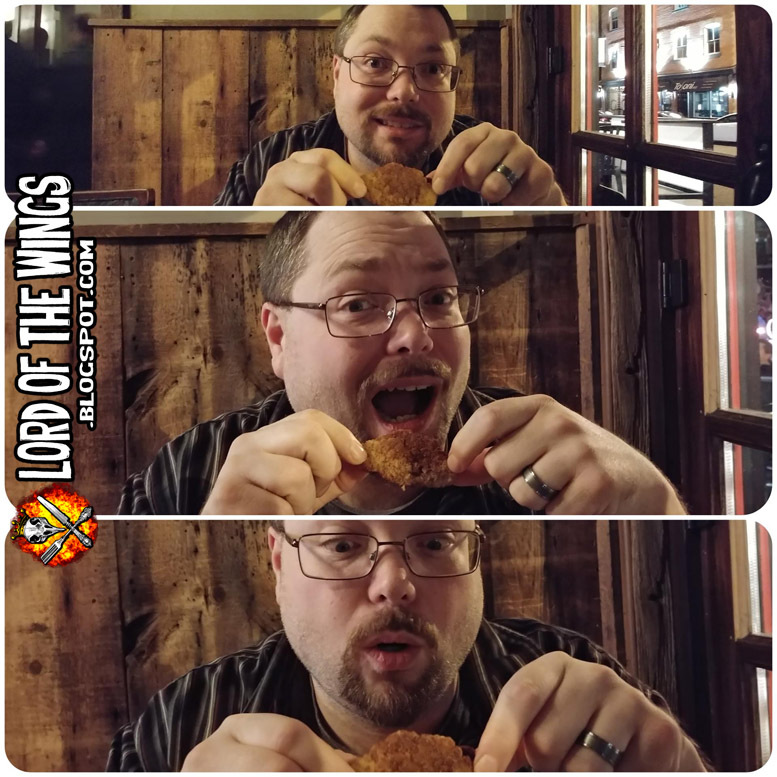 The glory of eating these wings was not worth it. Sometimes getting older and wiser isn't as fun, but damn I feel a lot better in the morning!